Beautiful abstracts! And those waterfalls look like one big ribbon down the center. We have friends that go to Banff every year – one friend did the horseback outfitter trips for a week. I’m not sure I’d last long in that chilly-looking scene you have there! Yay, abstraction! The first view owes its texture to the wind, the second to the refracting power of water. We visited Alberta at the warmest (and therefore also most touristy) time of year. The night before we left for home in mid-September, the Calgary weather report already mentioned snow in the mountains, and by two weeks after that one of the roads we’d driven to go up to a scenic lake closed for the winter. Like you, I wouldn’t do well in such a frigid climate. Thanks for explaining how those textures came about. Weather and various conditions can change everything in the blink of an eye. Yes, people seem to think since I’m originally from Nebraska that I must love or just tough out the cold weather. I never liked it, and I’m miserable in it for more than a couple of days. You’re welcome to the explanations. The second picture also shows the effects of wind, though not nearly as much as the first. We’re alike when it comes to living in cold places. I always felt chilled in the New York winters of my childhood and moved south by my late 20s, first to North Carolina for a few years and then to Texas ever since. The gradations of color in the first photo are beautiful, although it looks to me more like a thick-piled velour than mosaic. I can imagine the cross-hatching being created by someone pulling the pile this way and that with their fingers. If the second photo’s a close-up of what’s shown in the first, the difference between the views is remarkable. 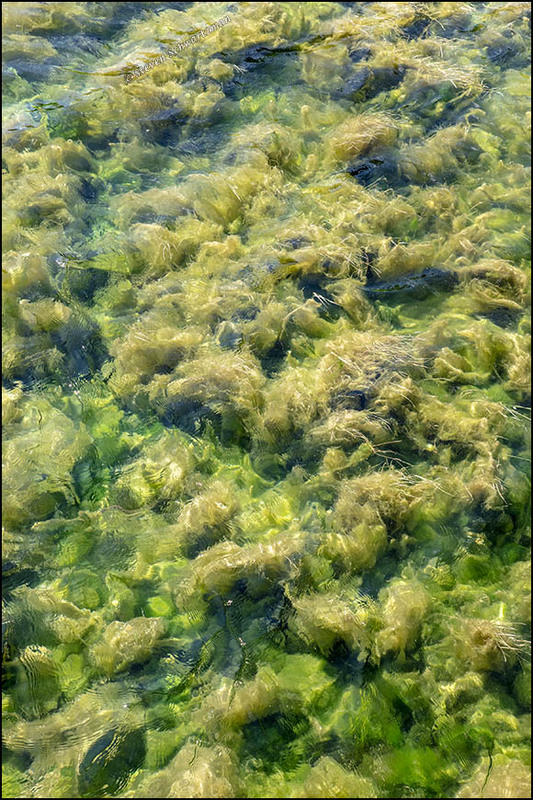 The second looks like our sea lettuce. 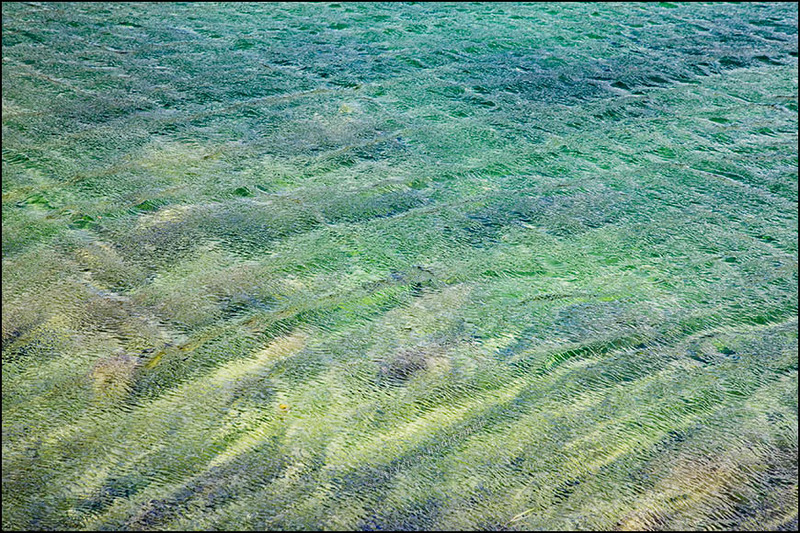 The ripples and the streaming filaments give it such a sense of movement, and of course it has that wonderful glimmer that clear water always adds. 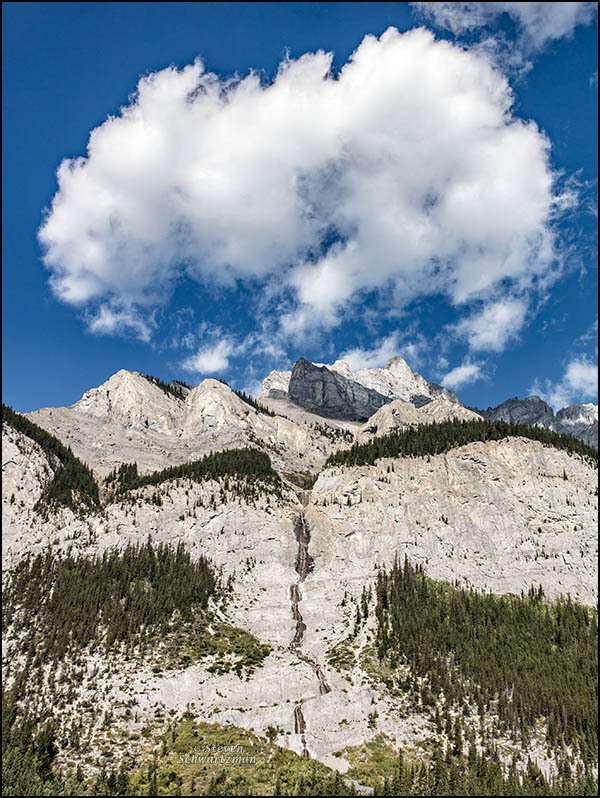 Did you notice how much the waterfall and cloud combine to create the appearance of a flower, with the waterfall the stem, and the cloud the bloom? Different views for different yous, we might say. Your association in the first image is with textiles, mine with glass. It reminds me now of the textured glass sometimes used on the sliding panels that enclose one side of a bathtub or shower. I should’ve made clearer that the second picture isn’t a closer view of what’s in the first. Different parts of the ponds had different-looking plants growing in them. The plants in the second photo were mostly close to the shore, while the view in the first picture shows how things looked a little farther out into the water. Like you, I get a sense that the plants in the second photograph are swaying in the water. Not till you suggested a flower did I see that likeness in the mountain and cloud. What a change of scale your imagination has worked. In the first picture I like the structure of the ripples on the water, but it is the last one, with that cloud in the blue sky above the towering rocks, that I like most. Good morning to you, too. Given the way the mountain grabs you, I can’t help thinking you’d find a trip to the Canadian Rockies thrilling. We saw literally dozens of mountains as imposing as this one. If this region isn’t already on your list, I imagine it should be. Some more portraits of enticing mountains will be coming up here in about a week. Then you can sing “Roll out the barrel, we’ll have a barrel of fun” as you visit the places on the list. Btw, we heard that yesterday, at the Doss Fish Fry. Doss is a little place close to here, and the Volunteer Fire Department had their annual fish fry (to collect donations). You’re welcome. It’s still a coincidence that I should’ve mentioned a song that you heard the day before. Thanks, Reed. It’s hard to go wrong up there, with so much to see. I’ve been recommending the Canadian Rockies to everyone since our trip a year ago. Those ponds are quite interesting. Glad you shared them with us. That cascading meandering waterfall is quite cool as well. As soon as I glimpsed the textures and colors in the pond, I was hooked. I think you’d have been, too. I see now that I took 18 pictures of Cascade Mountain with my 24–105mm lens, hitting both extremes and some other focal lengths in between. The picture shown here was at 35mm. If I view the first photo from a distance, I see wind blowing through a paddock of grass. In the last photo, the cloud looks poised to precisely deposit moisture at the top of the cascade. I would say that Cascade Ponds was a good place to ponder different views of water. That’s some original pondering you’ve done, and not at all ponderous. In the preponderance of accounts I’ve heard, water gets turned to wine. Now you’ve gone a different way, turning water to grass. Goodness! After all that, it sounds like I need a drink. Wine, perhaps. Better to wine than to whine, don’t you think? Glad to hear you’re a fellow cloud fan. Now you’ve made me wonder whether there’s anyone who’s not.